There’s a cherry tree planted at the front of a local Green P parking lot. The fruit is the bright red sour cherries that are great for baking or making jam. 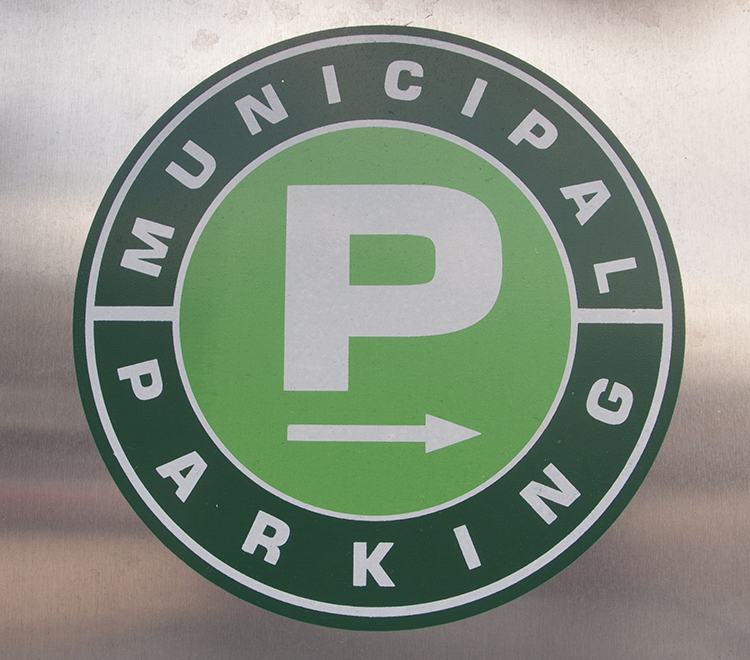 How did it get into the landscaping of a city parking lot? Must be the inspiration of some city workers, but we don’t really know. A fortuitous mystery; we have been keeping our eye on the crop for weeks. 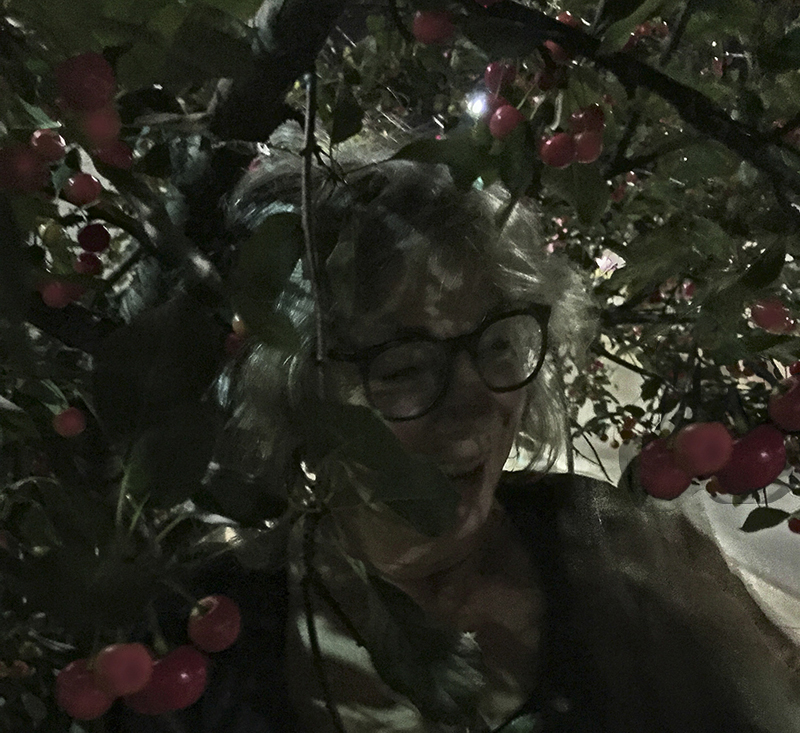 One advantage of city fruit is that night picking is easy under the streetlights. Teetering on my kitchen stool we could reach the prolific crop from the sidewalk. In twenty minutes we had picked our fill and left plenty for others. For me the object was jam and that freshly-picked fruit has to be cooked soon. When I got home I washed and pitted my take. I weighed them, figured out the proportions and pulled out my pot. I had one-and-a-half pounds of fruit, so one cup of gooseberry juice from my freezer and one cup sugar. By 1:30 a.m. the first jam of the summer. A tiny output from our midnight jaunt, but gorgeous, tart, delicious. In Toronto, it’s easy to make life a bowl of cherries. Here’s the idea. 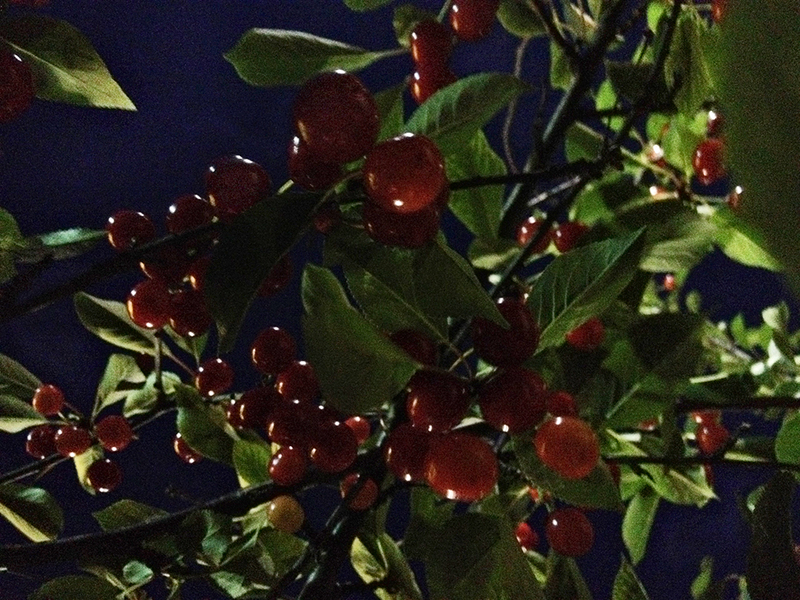 Every Green P Parking Lot in the city should have a sour cherry tree. They are beautiful, bountiful, and a lovely neighbourhood resource. And we could call the lots Parking Pits. This article can be found in WHAT’S HERE, in the section THE CITY. We picked by the light of a waxing gibbous moon. We got the same amount as last year from the same Green P tree and ended up with exactly the same quantity of jam. Then later in the week, an observant neighbourhood walker pointed us to a tree in Prospect Cemetery absolutely dripping with perfect sour cherries. We picked 4 lbs and the tree looked just as full when we stopped. It’s a new resource for locals, with plenty of cherries to be had. The gates close at 8 pm daily. Just bring a little ladder – we took the low ones. In the bitter cold of last January we met up at our cherry tree. The tree had become scraggly and seemed neglected and we want to maintain the health of this neighbourhood treasure. Pruning is best done then; the sap is not running so disease has no entry point, and the shape of the tree is clearer without leaves and fruit to obscure it. No telling if this year’s bounty is a direct result of our attention then, but the tree is lush and laden and we have picked our fill with plenty left for others. 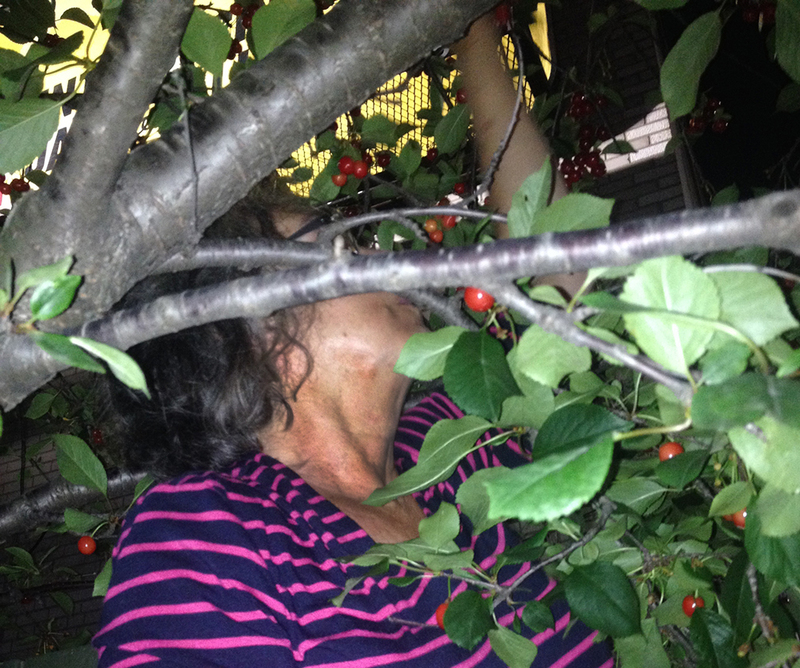 Cherry jam is in process, a pleasure to savour long after the harvest.